To enter this week's contest, name the musical artist you would most like to create the soundtrack to your personal film. My choice: Explosions in the Sky. If you are not a fan of music in movies, feel free to state "none." 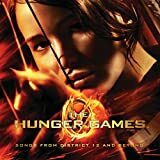 If you have already read The Hunger Games and already have or don't want the soundtrack, I am happy to substitute a second $100 Threadless gift certificate for the books and music. The winner will be chosen randomly at midnight ET Friday evening (April 13th).